(FSB Magazine) -- Debra Killian thought she was having a bad day when a backache forced her to stay home from work. Eager to see what was happening at Charter Oak Lending Group, the mortgage company she had started with her husband, Don DeRespinis, Killian logged on to her computer and checked the status of loans in the pipeline. Within seconds it became clear that her back pain would pale in comparison to what was about to hit. Loan after loan popped up as "suspended." While that had occasionally happened in the past - a deal could fall through, or a client might not get approved for financing - it was highly unusual to see a large number of lost loans at the same time. Killian called DeRespinis. "Have you checked the system?" she asked. "What the hell is going on?" "We never said our employees don't have a choice to leave. They just can't dismantle our business in the process." 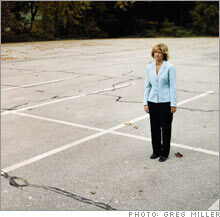 Debra Killian, co-founder of Charter Oak Lending Group, in the company's parking lot in Danbury, Conn. Experts warn that any small company can be harmed by a departing employee. Here's how to protect yourself. They won't be defendable in court if everyone knows them. "Develop policies that limit employees' access to the information they need for their job," says Michael Einbinder, a partner at Einbinder & Dunn in New York City. Have employees sign a nondisclosure agreement stipulating that they won't share trade secrets and spell that policy out in exit interviews for all departing staffers. Include a noncompete clause in your employee agreement. "The more limited [specifying a time and location], the more likely it is to be enforced," Einbinder says. Tim Bishop, partner at Bishop Jackson & Kelly in Stratford, Conn., who is representing Charter Oak, says that a nine-month ban on selling to accounts serviced by the departing employees is usually considered fair. It's not enough just to get your staffers to sign an agreement, says Bishop. You have to educate them about what belongs to them and what doesn't (such as work that is performed on an office-issued computer). By the time DeRespinis looked into it and called her back, four of Charter Oak's employees had quit without giving notice. Realtors and real estate attorneys began to call the Danbury, Conn., office saying that they had just received cards postmarked days earlier announcing that the (now former) employees were moving to CTX Mortgage, a giant broker and lender and a subsidiary of Dallas-based Centex (Charts), one of the country's leading homebuilding companies. Over the next few weeks several more employees defected. In total, ten key staffers - nine loan officers and one processor (a friend of Killian's since kindergarten) - left to join CTX. Not only did Charter Oak lose a third of its staff, Killian says, but it also lost about 150 pending loans, worth almost $1 million in fees. Additionally, the employees copied customer lists and knowledge about Killian's confidential referral sources. One employee walked out with six boxes of files containing Social Security numbers, mortgage applications, tax returns, credit reports and other nonpublic personal information. "It was almost like an out-of-body experience," says Killian of those weeks. "I saw it happening and didn't know how to stop it." Her former employees now work about two miles away and make up nearly the entire staff of CTX Mortgage's Danbury-area office - a location CTX considered a priority but had struggled with over the years, according to a former CTX manager. Meanwhile, her company, Charter Oak, has fallen into financial straits. Once comprising 32 employees, the staff dwindled to just five. (Ten quit to go to CTX, others left fearing the company would shut down, and some were laid off.) Revenue plummeted from more than $3.5 million in 2004 to a mere $300,000 in 2005. "What took us ten years to build CTX stole in 38 days," Killian says. Although corporations can - and do - raid talent and trade practices from small businesses in all industries, the Charter Oak case is worse than most, says Andrew Sherman, a partner at Washington, D.C., law firm Dickstein Shapiro: "One employee goes to the competition all the time; 35 percent of a workforce leaving and disabling the business is not common, and cannot and should not be tolerated." Killian's case is even more frustrating, she says, in that she may have played an unwitting role in her employees' departure by sending them to a training seminar where they were introduced to CTX. In other words, she alleges, she paid for it to happen. Killian filed a lawsuit in December 2004 against CTX and the employees who left, alleging unfair trade practices, misappropriation of trade secrets, breach of fiduciary duty and computer-related offenses, among other charges. This summer the Danbury Police Department opened a criminal investigation and obtained search warrants to investigate CTX offices in Connecticut. Most recently, in September, Connecticut attorney general Richard Blumenthal and the state's Department of Consumer Protection filed a lawsuit against CTX for corporate raiding and misappropriation of trade secrets. The complaint says that 90 percent of CTX's Danbury client list matches that of Killian's employees and calls CTX's actions "unethical, oppressive and unscrupulous." "CTX acted as a corporate parasite - illegally draining the lifeblood from its competition," said Blumenthal in a press release. "This unconscionable pillaging stifled competition and in some cases led to some consumers paying higher interest rates on home mortgages." In an e-mail to FSB, Danny Deaton, executive vice president at CTX, defended the company's practices, saying, "CTX was surprised and disappointed at the recent action by the attorney general and the Department of Consumer Protection. We are confident that when the department reviews and fully understands all of the facts and circumstances surrounding the matter, it will agree that nothing improper occurred." Killian, who still works in Charter Oak's 12,000-square-foot office - now mostly empty - hardly sees it that way. She had an employee handbook spelling out policies on proprietary information, which she says she reviewed each year with the staff. "We never said our employees don't have a choice to leave," she says. "They just can't dismantle our business in the process." Her story is a cautionary tale for any small-business owner who deals with, and competes against, big corporations. In many ways Killian, now 51, seemed destined for the mortgage industry. When she was growing up in Connecticut, her grandmother worked in a bank, her father was a builder, and her parents owned a real estate company. After starting and selling a bookkeeping business and working for several small mortgage brokers and lenders, Killian opened a mortgage company of her own, with DeRespinis - her former accounting professor and now her husband - as her business partner. Killian focused on management and training, and DeRespinis, a CPA with a penchant for information systems, designed software programs and ran the back office. Killian and DeRespinis didn't have any children together, and they saw the business as their baby, working 60- to 70-hour weeks and putting their profits back into the company. They wanted to hit $10 million in fees in ten years, a goal that DeRespinis wrote on a slip of paper and carried in his back pocket. At the end of each year he would pull it out and announce whether the company was on track to reaching that milestone. The business grew especially quickly in recent years, helped by the real estate boom, but as interest rates began to inch up in 2004, Killian feared that the company's growth wasn't sustainable. She wanted to position Charter Oak for a possible slowdown and started looking for new strategies. She thought she had found the answer at a conference in Salt Lake City in June 2004. One speaker, in an event sponsored by Centex (the parent of CTX), was sales guru Todd Duncan, a bestselling author and the Tony Robbins of the mortgage industry. Duncan, whose Web site is candid about his struggles with a cocaine addiction and the financial collapse of his former company, focuses on his road to "recovery and redemption." His seminars incorporate a nearly evangelical spirit with an emphasis on values, morality and God. Killian admits she was rapt; she spent more than $1,500 on his instructional CDs, books, and DVDs. At another session at the conference, Jim McMahan, a senior loan officer and branch manager for CTX, spoke about sales-training techniques. Killian stayed late to speak with him, shared stories from her company and soaked up his advice. She says McMahan suggested that she attend an upcoming conference offered in Palm Desert, Calif., by Todd Duncan's company, Duncan Group, based in Duluth, Ga.
Killian eagerly went to the seminar in Palm Desert and paid for the accommodations, meals and rental cars of the seven employees who joined her. (They paid for their own registration and airfare.) Once again, Killian was galvanized. The event featured a country-rock band that charged up the crowd. "They sucked me in emotionally," she says. She even spent $17,000 on one year of coaching with a company that was promoting its services at the conference. At the time Charter Oak was in good shape and had recently opened a second location, Killian says, and she thought the speakers at the conference offered helpful insight to further grow her business. When she got back to the office, she tried to implement the strategies she and her team had learned. She began one-on-one telephone calls with her coach every other week. In trying to help her build her business, he requested that she send him a list of her loan originators, their rank in terms of sales, and their years in business, which she did. Through it all, she remembers thinking, "This will get us to where we need to be." Killian says she locked herself in her conference room from 9 A.M. to 9 P.M. to study the seminar materials, and shared them with employees in a three-day boot camp. She tried to make it fun, with a Trump-like "Apprentice" game and rewards, including lunch at Tavern on the Green in New York City. Not long after that, morale at the company began to decline. Killian thought it was because of a new commission structure she was about to implement. Several employees voiced concerns that it might reduce their pay, and Killian began to notice small groups of her staff meeting behind closed doors. She says she had no idea that her top producer and several other employees, as they later acknowledged in depositions, were setting up meetings with CTX recruiters. Before the employees quit, they were directed by CTX to compile lists of their clients and realtors. According to legal depositions, the information was forwarded to CTX in e-mails or on disks. As employees were departing, DeRespinis began to grow skeptical of the links between the Duncan Group, CTX and the coaching he and his wife learned about at the conference. "We liked the Duncan training - it was very good - but eight weeks later when your people go to work for the people who spoke there, something's wrong," says DeRespinis. "They say they're independent, but that's baloney." DeRespinis grew more suspicious when a similar incident happened at another small mortgage company. First Houston Mortgage in Texas lost six employees and its database to CTX in February 2006 - shortly after spending thousands to send two staffers to a training event offered by the same group. "It was a great seminar to learn and get motivated," says Dana Gompers, CEO of First Houston. "I just didn't expect that my best employees would be cherry-picked. CTX took 10 percent of my company in one month." Besides featuring CTX employees at its conferences, the Duncan Group has no formal relationship or shared ownership with CTX, according to company filings. Todd Duncan declined to comment for this story. The lawsuit filed by Connecticut's attorney general depicts the Duncan Group as an entity "closely affiliated with the defendant [CTX]" and describes the training conference as the place where CTX "met with one or more" of Charter Oak's employees and "began recruiting them," but it neither accuses the Duncan Group of any wrongdoing nor brings any charges against the company. McMahan and Habib both speak at dozens of conferences a year; neither was named or charged in the lawsuits. "Mortgage industry people get recruited every day left and right in this free-enterprise world that we live in," says Habib. He adds that he gave a Charter Oak employee the name of a contact at CTX from his BlackBerry after she approached him about wanting to make a career move to CTX, but that he did not recruit her and he would just as gladly have given a potential hire the contact information of someone at any other mortgage company about which they inquired. "A 15-second conversation exploded into this horrible thing," Habib says, adding that his work with CTX has "nothing to do with recruiting" and that he gets "no compensation for recruiting." "Ninety-five percent of my income is from the Mortgage Market Guide, which helps 16,000 professionals everywhere," says Habib. "Why would I ruin my reputation by doing recruiting for CTX? That would be suicide. Slitting my wrists would be less painful." While Habib may be right that no recruiting happened at the Duncan conferences and that Killian's employees were simply introduced to - and intrigued by - CTX, two of them attended a subsequent event called Passion for Production, which was limited to CTX employees and recruits. Fred Shepherd, a former CTX manager who was let go by the company in November 2004, calls it a "dog-and-pony show." In a deposition, Shepherd explained, "They wanted us, as manager, to bring recruits to a meeting that would, basically, [be] under the auspices of, 'Let's get these people that you have come to a three-day seminar offsite in a neutral location.' It would be about CTX.... They would have some big players from inside the company come in.... 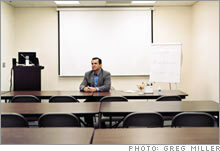 I believe the auspices of the whole meeting was really, basically, recruiting related." About two weeks after attending Passion for Production in Atlanta (airfare and hotel arranged by CTX), the first wave of Killian's employees resigned. Charter Oak V. CTX won't go to trial until April 2008, and already Killian has spent about $200,000 in legal fees, culled from retirement savings, family and a home-equity loan. "The money will run out," says Killian. "It hasn't yet, but it will. We're not CTX." Living and working in the same Connecticut town as her former employees has been trying. Killian has seen some of them eating breakfast at the local diner. Mostly, the parties ignore one other. "I don't know what's going to happen," she says. "We're going to take it day by day and try to keep going." DeRespinis remains steadfast: "We had every possibility of doing well until this happened," he says. "We won't shut down. Our blood is business." Have you ever lost business or staff to a larger competitor? Tell us about it. To give feedback, please write to fsb_mail@timeinc.com.